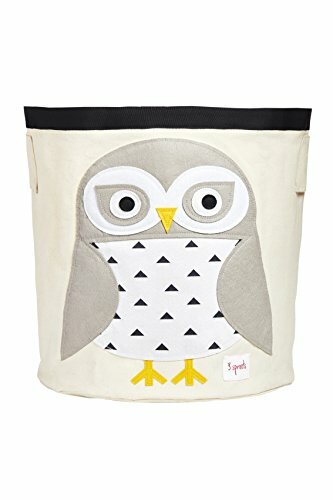 CUTE & DEPENDABLE: Kid-favorite animals front every storage bin and complement even the nicest dressed home. Choose from a dinosaur, elephant and more for a charming piece of furniture. Always made durable for long lasting unisex decor. COLLAPSIBLE DESIGN: Bin folds away when not in use, keeping you from wasting precious space. With a large 17'' capacity, and 17.5'' height, the storage bin is perfect for baby shower gifts, toys, books, clothes, games, doll accessories, or match-box cars. TOT/KID FRIENDLY: Handles on the side of the bin make it easy for your boys and girls to hold the bin and carry it to whatever room holds their stuff. Kids will love the lightweight design and fun felt colors such as pink, gray, blue, and black. EASY CLEAN: Made of 100% Cotton Canvas that is tough enough to hold whatever you throw in it. Rest easy knowing the hamper is coated on the inside making it easy to wipe clean with just a cloth and water. Kid-proof and parent approved.